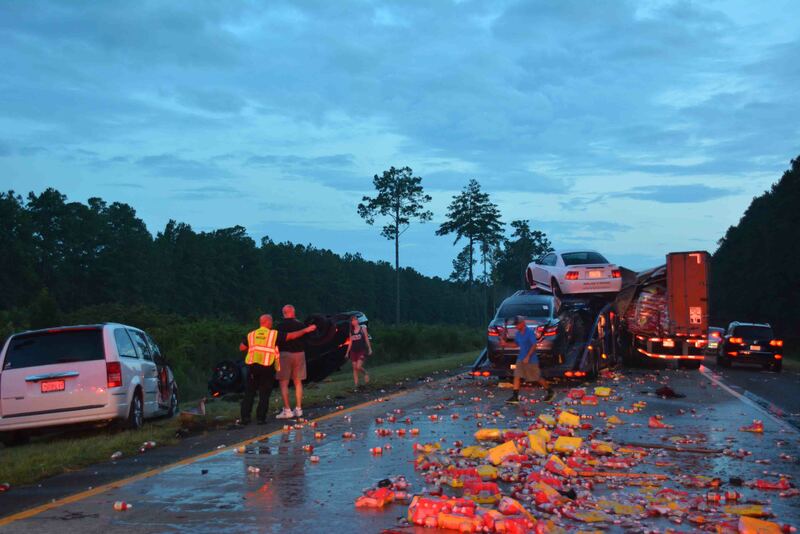 Six vehicles were involved in a crash on I-95 near the 52 mile marker southbound Wednesday evening 30-August. At 19:50, several callers to 9-1-1 reported the multi-vehicle accident, advising one car was overturned. Several Fire-Rescue units had just cleared from an earlier fire approximately 1 mile south and arrived minutes later. Medic 1 arrived to find the Interstate blocked. Click here for more information. 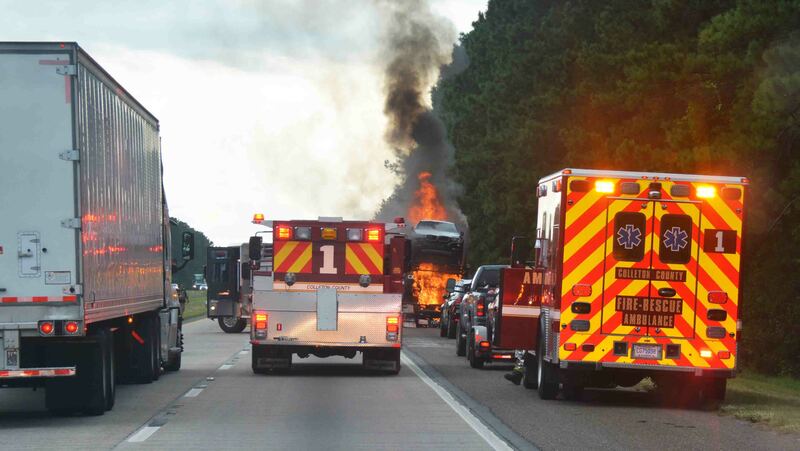 An 18-wheeler automobile transporter caught fire on I95 near the 50 mile marker southbound Wednesday afternoon 30-August at 18:24. Callers to 9-1-1 reported flames coming from the rear tandems on the trailer of the transporter. The truck driver pulled into the breakdown lane and was able to remove one of the new BMW SUVs from the trailer. Click here for more information. A 20 year old male received first and second degree burns over parts of his upper body and arms after a gas can exploded in the 200 block of Fennel Lane Sunday morning 20-August at 10:14. Law Enforcement Officers from the Sheriff’s Office and Town of Cottageville had responded to the location for another matter and found the suspect under a tree huffing gas fumes and smoking a cigarette. 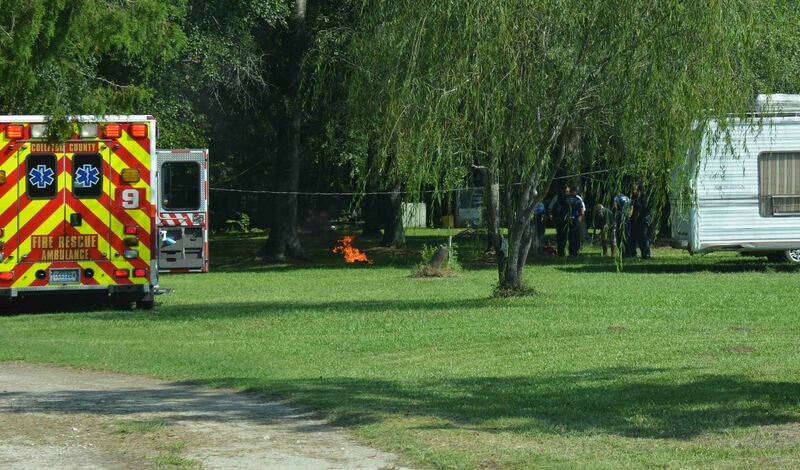 A short time later the gasoline ignited, engulfing the man. Click here for more information. 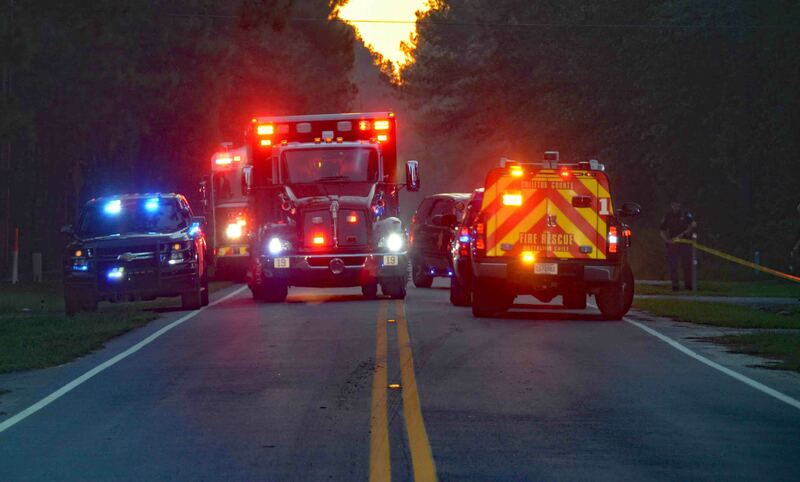 A 10 year old male was severely injured when his right arm was amputated in an accident at Benton’s Peanuts in the 12700 block of Lowcountry Highway Saturday 19-August. At 12:24, Colleton 9-1-1 Operators received a call from a woman advising the child’s arm had been caught in a processing machine and was amputated below the shoulder. Firefighter-Paramedics on Medic 18 arrived to find the child sitting in a chair in the parking lot. An adult male was controlling the bleeding. Click here for more information. 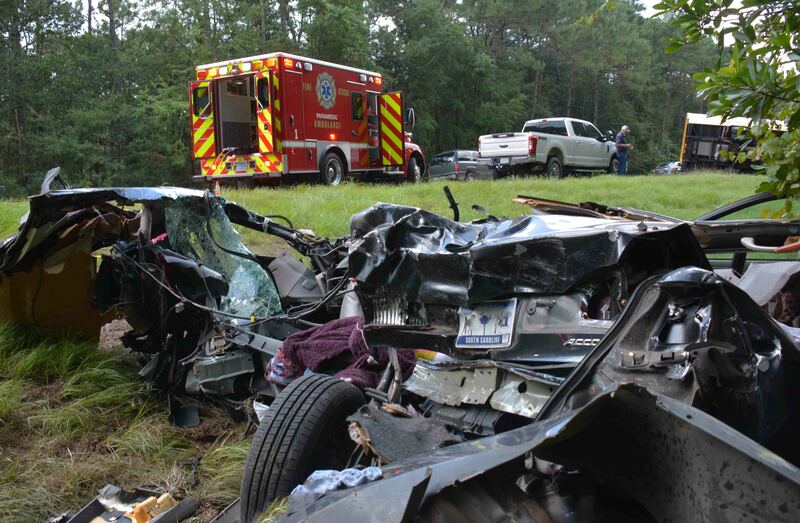 One person died and three others were injured in a two vehicle high speed collision on I-95 near the 44 mile marker south bound Thursday morning 17-August at 11:43. A southbound Chevrolet moving van collided with the rear of a Honda Accord causing massive damage to the car. The van traveled a short distance before rolling over on the driver’s side, trapping the two adult male occupants. The Accord was thrown to the wood line, ejecting the male driver from the car. Click here for more information. An adult male received a single, small caliber gunshot wound to the leg during an altercation in the 400 block of Estates Drive Thursday morning 17-August. 9-1-1 received reports of the shooting at 07:11. The man was treated at the scene by Firefighter-Paramedics from Station 19, then transported to Colleton Medical Center. The injury was not life threatening. The Colleton County Sheriff’s Office is investigating the incident. Click here for more information. A two car head-on collision sent five people to the hospital Wednesday afternoon 16-August at 18:49. The accident occurred on Robertson Blvd just west of North Lemacks Street. Fire-Rescue units arrived to find a black Trail Blazer SUV at the wood line with one adult male patient. A small Dodge Dart was found in the roadway with heavy damage. 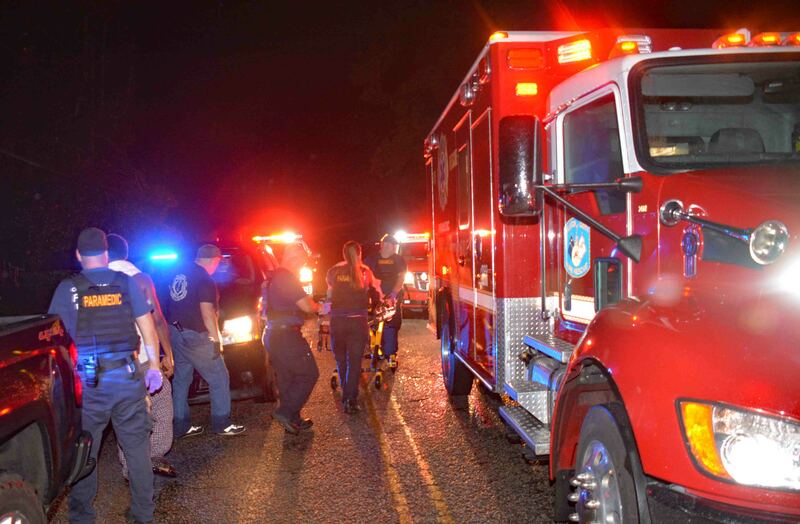 First arriving units requested two additional Fire-Rescue ambulances and placed the C.A.R.E. 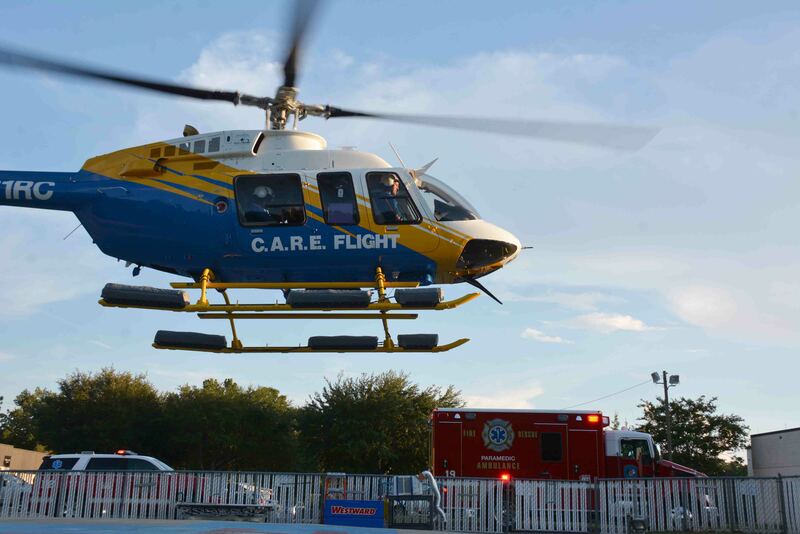 Flight helicopter on standby at Colleton Medical Center. Click here for more information. 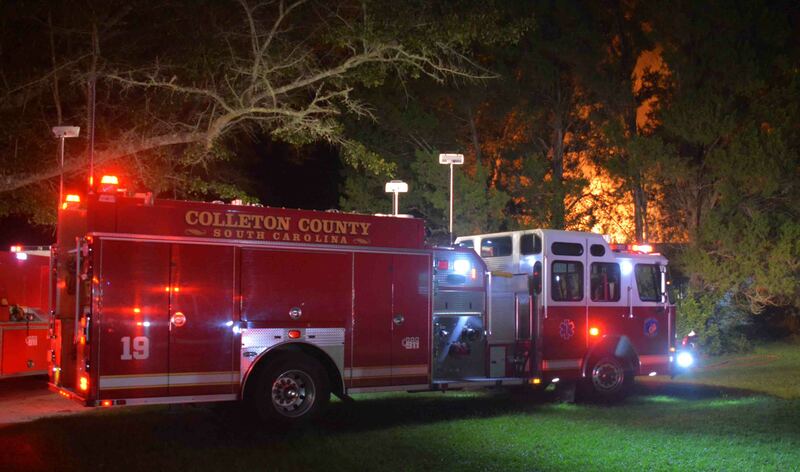 At 00:36, Wednesday morning 16-August, a passerby reported seeing flames coming from a residence in the 4000 block of Jefferies Highway, north of Walterboro. The caller advised he could see fire coming from both sides of the roof. Engine 19 arrived minutes later to find a single story wood structure approximately 50% involved. Heavy fire conditions were found at the rear of the building, with two rooms already collapsed. Click here for more information. 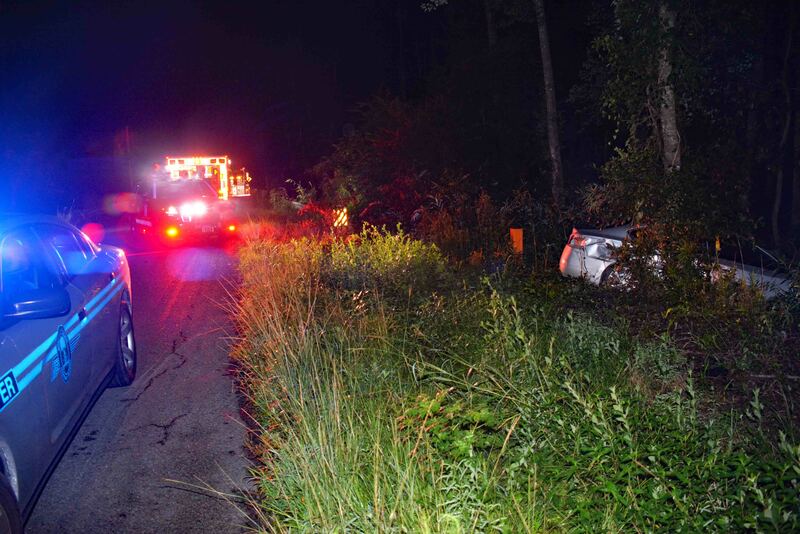 At 01:27, Saturday morning 12-August, 9-1-1 received a report of a car off in the woods in the 4200 block of Red Oak Road north of Rebel Lane. 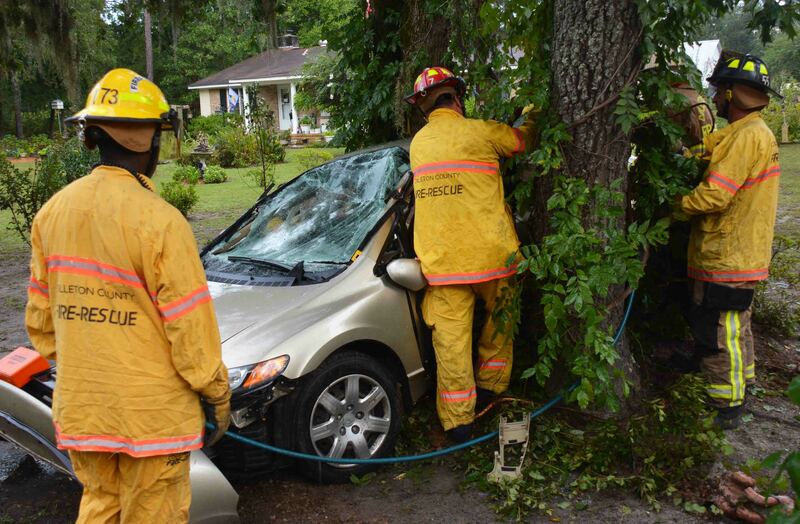 The caller reported the car struck a tree and a female patient was trapped inside. 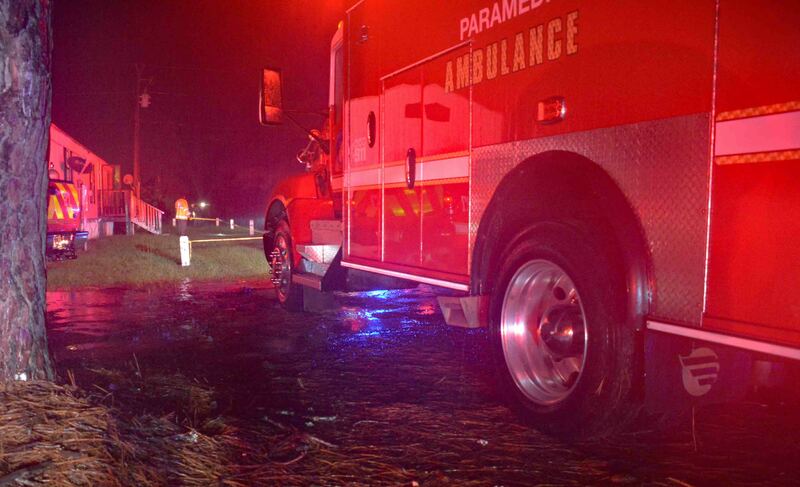 Firefighter-Paramedics arrived to find a Nissan Altima down in the swamp against a tree. Crews found the woman unresponsive and not breathing. They were able to quickly remove her from the car and began resuscitative efforts. Click here for more information. An adult female was injured in a single car MVC in front of 19461 Augusta Hwy east of Sidneys Road Friday afternoon 11-August. At 18:34, 9-1-1 received several reports that a small car left the roadway at a high rate of speed and struck several trees. Firefighter-Paramedics arrived to find a Honda Civic against two trees with the female driver trapped inside. It appeared the west bound car left the wet highway and skidded sideways, then struck the trees on the east bound side of the road. Click here for more information. Two people were shot in a reported drive-by shooting in the 800 block of Gadsden Loop Wednesday evening 09-August. At 23:33 9-1-1 received reports of shots fired into a residence and people were injured. Sheriff’s Deputies arrived within minutes, advising a male victim had left the scene in a privately owned car and was enroute to the hospital. An adult female was still on the scene with a serious injury to her hand. Click here for more information. A 24 year old female was fatally shot at a residence located at 25 Twin Oaks Lane north of Walterboro at 20:55 Wednesday evening 09-August. The caller to 9-1-1 who reported the shooting advised 9-1-1 Dispatchers the woman was not breathing. Sheriff’s Deputies cleared the scene and Firefighter-Paramedics found the woman without any signs of life. The Coroner’s Office was notified and responded to the scene. Click here for more information. Incident # 17-05486 – A 34 year old male was injured in a shooting incident at 16072 Sniders Hwy in the Islandton Community, Tuesday afternoon at 13:37. Deputies cleared the scene prior to the arrival of Medic 18. Firefighter-Paramedics found the man seated on the ground with a GSW to the hand and another to the shoulder. He also had other traumatic injuries. 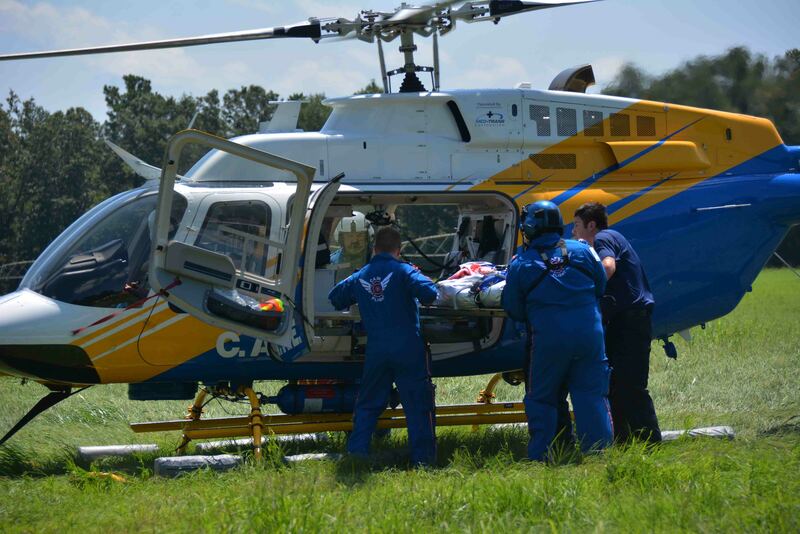 Crews had some difficulty controlling the bleeding from the shoulder wound and rapidly transported to Colleton Medical Center so the patient could be stabilized. The patient was treated enroute to the ED including multiple IV lines. The Colleton County Sheriff’s Office is investigating the incident. Engine 15, Medic 18 and Battalion 1 responded. Captain Mikey Banks served as Incident Commander.